Ruben Lundgren (born 1983 in Hilversum, the Netherlands) is a Dutch photographer, editor, curator and collector based in Beijing. He graduated from the Central Academy of Fine Arts and worked as part of the Dutch photographers duo WassinkLundgren. Their works have been exhibited in museums worldwide and they are the recipients of numerous awards, including the China Academy Award in 2010 and the Prix du Livre at Les Rencontres d’Arles 2007 for their publication Empty Bottles. Notable projects include WassinkLundgren Is Still Searching (2006), Tokyo Tokyo (2010), Luxiaoben (2010) and Hits (2013). A retrospect of their work was shown in the FOAM photography museum in Amsterdam in 2013. Together with Martin Parr, Lundgren co-edited The Chinese Photobook, from the 1900s to the present (2015). Recently he works as a photojournalist for the Dutch newspaper De Volkskrant and sources photography for The Archive of Modern Conflict. In 2018, Lundgren curated, along with Timothy Prus, the exhibition Anything That Walks at Jimei x Arles international photo festival. Anything That Walks — Vernacular Food Photography From China brings together a disparate and eclectic collection of amateur photos and photo albums of Chinese food and food production. Doors asked him a few questions on this occasion. Can you tell us a bit about your background, and how you first came to China? Yes, I've been visiting China since 2005. For my graduation on the Utrecht School of the Arts in the Netherlands, I went to Shanghai. It was my first encounter with any place in China and I wanted to explore more. In 2007, I started my masters studying photography at the Central Academy of Fine Arts and I have been living and working in Beijing ever since. What are the projects that have been keeping you busy these past few years in China? I've always worked as a photographer doing my own projects and work for a Dutch newspaper as well. But in recent years I also started to collect photography and curate photography shows with it. One outcome in 2015 was the book and exhibition The Chinese Photobook, from 1900s to the present that I made in collaboration with British photographer and collector Martin Parr. I also started to work with the Archive of Modern Conflict and explore the rich culture of Chinese vernacular photography for a few years now. Your exhibition Anything that walks - Vernacular food photography from China is currently on view at Jimei x Arles. How did you first start working on it and what did you and your co-curator Timothy Prus from The Archive of Modern Conflict want to convey through this project? I've been in touch with the Archive of Modern Conflict for many years. They published and collected some of my previous photography projects like Tokyo Tokyo (2010). A few years ago, I started to collect Chinese vernacular photography for their collection. Not only food related but really anything I found that was interesting, I would collect. You would be surprised of some of the beautiful materials that can be bought at flea markets all over the country. The first reason we wanted to do this show is to share some of our best finds. Since it’s a bit too much to show it all we decided to limit ourselves to food related images as many of these photographs have never been seen outside the small circle they were made for originally. Most of the items come from flea markets. The biggest and most famous in Beijing would be Panjiayuan. If you spend enough time going through all the shelves you can really find great stuff. The online second hand market is also pretty big. Which photo(s) do you think is the most surprising or interesting? My personal favorite would be the photo from the box "Frozen Game" titled: Wild goose, Roast wild Goose. It made me laugh when I saw it. I guess that has to do with the dry layout of the photograph placing a living and roasted goose next to each other. It’s like a Chinese mindset looking at the bird as something that may taste good. So funny. The earliest photos in your exhibition were made in the 1960s. It’s interesting to see how food photography has evolved up until today. Do you see a continuity in this evolution? What do you think of food photography in today’s social media world? There is an absolute link. In my belief, there has always been a connection between beautiful food and photography. This relation has evolved just like the medium of photography. It wasn’t so long ago that Stephen Shore made his 4x5 inch photographs of the food he ate in diners across the United States and became one of the artistic founders of this tradition. In society nowadays it is so common to photograph your food that one can easily say: when dinner is served, the camera eats first. Unlike many of the food photographs on social media however, the nice thing about working with vernacular food photography is that it is surprisingly creative. 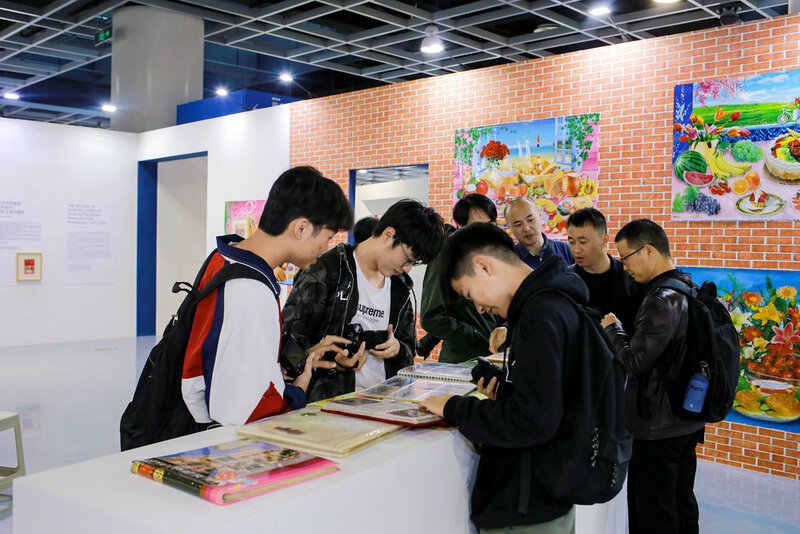 Anything that walks is a very unusual and particular exhibition, from the humorous title to the spatial arrangements in the Jimei Citizen Square Main Exhibition hall – with tables and chairs for the visitor to eat at while looking at pictures of food. How did the Chinese audience react to it? What kind of feedback did you receive? I have seen many smiles in the exhibition. It’s the colors, the nostalgia, the messiness and of course the sunflower seeds that give a feeling like home. Or how one of the visitors told me: "It’s like walking into my grandmother’s place". I took that as a huge compliment. You co-curated the exhibition with Timothy Prus. Can you tell us about the organization of the exhibition? What was your aim when combining extra-large prints to very small ones, to photo books and sunflower seeds? Our first aim would be for people to feel at home and, at the same time, we wanted a visual explosion of materials. Both Timothy and I are a fan of exhibitions that feel not so pretentious and can be understood by both the common visitor and the photography elite. Combining different materials keeps the audience sharp. I personally love to sit a while in an exhibition and have a look around. When we thought about the sunflower seeds we simply could not unthink about it anymore and had to do it. You have been living in Beijing for some time now. How has living in China influenced your work? It’s hard for me to imagine how my work would have been without the influence of China. Obviously many of my projects are directly linked by topic to China so in that sense it has definitely been influential. What are you cooking up nowadays? Any sneak peek on new projects you’re working on? Well, the whole project with the exhibition and also with the limited edition book MeNu we made for it, I am tempted to do continue in this line. Recently I found this wonderful fashion magazine about different types of workers clothes in the early 1970s. It’s absolutely stunning. I thought about doing a show completely focused on fashion from 1950's till let’s say the 1990s. Everybody knows how embarrassingly funny it can be if you look at your own outfit from a decade ago or longer. Fashion in the 1980s in China was so much fun, I already have plenty of ideas for this and am looking forward to realize it. If anybody has some suggestions for good photographs feel free to send them to me !